Ty’s is a traditional framer who hand cuts your mats and builds your frames by hand. See the difference pride, attention to detail and craftsmanship makes. 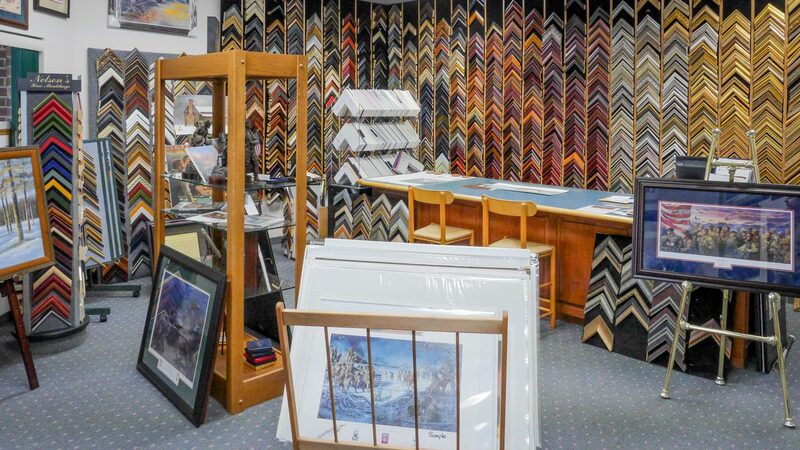 Ty’s Custom Picture Framing provides you with the very best in presentation and conservation of your art and memories. A large selection of frames and mat choices combined with expert attention to detail offer your a multitude of combinations. Stop in and see our large selection of military art work. Ty’s is an authorized dealer for James Dietz, Stuart Brown, Don Stivers, John Paul Strain, Valor Studios and Mort Kunstler. Ty is also a dealer for Bob Timberlake and Somerset Fine Arts. Not Just Frames, Art Too! Ty's also carries art and he specializes in military art. Ty is an authorized dealer for James Dietz, Stuart Brown, Don Stivers, John Paul Strain, Mort Kunstler, and Bob Timberlake. Ty can assist you with buying or selling art on consignment in the secondary art market. Ty's frame shop is conveniently located off Morganton Road near Cross Creek Mall, Ft. Bragg and Haymount. He takes pride in the craftsmanship that goes into each job. Ty can frame art, flags, banners, fabric, medals, photographs, and collectibles. If you want it in a frame, Ty has probably done it before. Ty is very professional and stays in the know on custom framing. He has a great eye for color combinations. I would highly recommend him as a framer. Ty is a master framer. Military Art Specialist, and one of the kindest people you will ever meet. He has served all my framing needs for 10 years and thousands of dollars. He treats every project like it is going to hang in his Mother's living room. Look no where else but here. Ty is the best custom framing resource in Fayetteville and the only framing resource I use. I have been a customer of his since 1997. From unique, custom military framing requirements to beautiful and decorative framing for photos, prints and paintings for the home Ty will collaboratively work with each customer to surpass their expectations. Choose Ty and don't look back. Ty has such a great eye for putting combinations of colors and mats together. I am always impressed by his creative designs. Ty is probably the best we have in Fayetteville. He just seems to know what I am thinking about before I even lay it out. I love incorporating other pertinent items with my artwork and Ty has a great feel for that. I wish you could see the water color Red Drum that was framed at Ty's. It absolutely perfect! I have him no instructions regarding mat or frame style, and I couldn't be happier with the result. Great Job! If it's a heirloom leave it up to ty to protect. Best framer in Fayetteville hands down. Lots of military art. Great selection of military art. Very detailed custom framing and high quality materials. Priced right and quick turn around. Friendly customer service. This is a business that has been working in town for 20 or more years. Ty hand cuts his mats! He is quite talented and can make up a display if that's what you need. He's near Fort Bragg and many of the military units use his services. Great guy and great service. Ty has framed and repaired a number of our prints and paintings over the past 15 years. Without exception, he has done absolutely superb work. Ty will always provide the very best service at the highest quality. You will be well pleased. Amazing service and great work! Highly recommended! I cross-stitched a piece for some friends as a wedding gift, and put a lot of effort into it. It had beads, metallic thread, and all sorts of things. He picked out several framing samples, and all were good; one was perfect. He did a beautiful job. I can't say enough. I was so excited when I picked it up that I showed it to a complete stranger and exclaimed, "Isn't this amazing?! He does such a fantastic job!" Ty doesn't work on just military prints - he can frame cross stitching as well. Not everybody can do that, since not that many people cross stitch anymore. He gets things done on time, too. Absolutely amazing! I was on a tight schedule to get a print framed for an Art Gallery Exhibit and everything worked out and my print turned out more amazing then I had imagined! Will be using Ty's Custom Framing for all my framing from now on! Thanks Ty! Ty does not merely frame excellently; he is a true artist with the extras I have wanted in framing Civil War prints. I have included things like reproduction CW prayer books and Ty has done all of the custom matting and framing beautifully. And yep...He is one of the nicest guys you will ever meet. Awesome person to work with! Does a great job. Ty has framed everything that I own that is worth framing. For the price and quality of workmanship there is no one better. Ty is what we used to call a professional. He is committed to his craft and he strives to give the best service and product. Highly recommended for anything from a shadow box to a fine piece of art.